Mai Tai Season is Back! 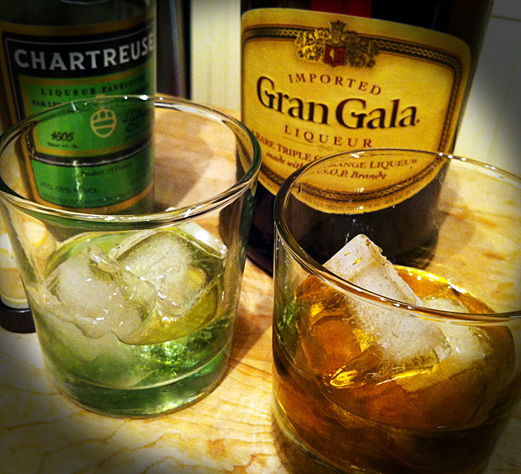 1 shot of Green Chartreuse (only this in the glass on the left), and 1 shot of Gran Gala (my favorite orange liqour), over ice. Quite yummy, while still being odd. 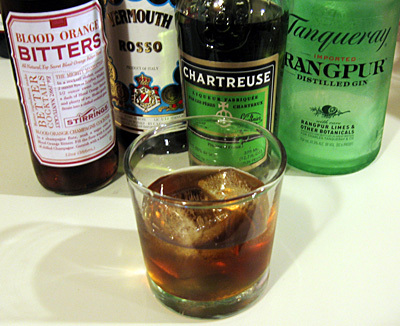 New Drink Recipe, which is a bit involved. Step 2: Mix 1 cup of watermelon juice, 1 cup of lemon juice (we just bought big bottle at Costco here), and 3/8th cup of powdered sugar. Use a whisk to help dissolve the sugar. Step 3: Pour the mix into the ice cream maker and leave it for 15-20 minutes. The result here is kind of sorbet like. Yummy! Step 4: Buy a big bottle of cheap vodka, dedicate a Brita pitcher to the filter of said vodka, then run that vodka thru the Brita 3 times. (4th time gains you nothing really, we tested it). Step 5: Put at least a small bottle of the vodka in the freezer overnight. Step 6: Making the drink. 1.5 or 2 oz of Vodka (from the freezer), an equal amount of soda water, and at least 4 ice cream scoops (2″ balls) of the sorbet, all into a glass. We’ve discovered a strange new cocktail this evening. Equal amounts of sweet vermouth, green chartreuse and gin (.75 oz ea in this case) and a splash of the blood orange bitters. We like this name better than the one it came with, because if you try to describe the taste of this drink, all you can come up with is “It’s complicated”.